A few years ago in the archives of the William Eggleston Artistic Trust in Memphis, a box was found containing Eggleston’s earliest photography – remarkably in black and white. The photos were subsequently exhibited at Cheim & Read gallery in New York and sold. This book reunites these photos in their entirety, and shows the artistic beginnings of a pioneer of contemporary photography. In the late 1950s Eggleston began photographing suburban Memphis using high-speed 35 mm black and white film, developing the style and motifs that would come to shape his pivotal colour work including diners, supermarkets, domestic interiors and people engaged in seemingly trivial and banal situations. Now, fifty years later, all the plates in Before Color have been scanned from vintage prints developed by Eggleston in his own darkroom. 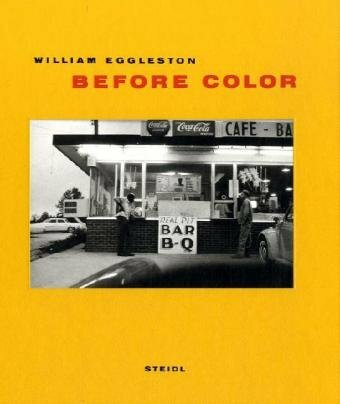 In the mid 1960s Eggleston discovered colour film and was quickly satisfied with the results: “And by God, it worked. Just overnight.” Eggleston then abandoned black and white photography, but its fundamental influence on his practice is undeniable.